EQUILIBRIUM Massage Therapies can also be found on www.massage-info.co.uk. SPECIAL OFFERS for YOU... available every day of the year! Please have a look at my extensive list of special offers available to NEW and EXISTING clients. There is always a way to get an extra special offer for yourself, especially if you have multiple treatments or wish to buy a package of treatments upfront, to ensure that you keep yourself regularly maintained in mind, body and spirit. THE PERFECT BIRTHDAY GIFT for that special person! Wondering what to buy that special person in your life for their Birthday? Well, why not take the stress out of your life and theirs, by giving them an exclusive Equilibrium Gift Voucher? 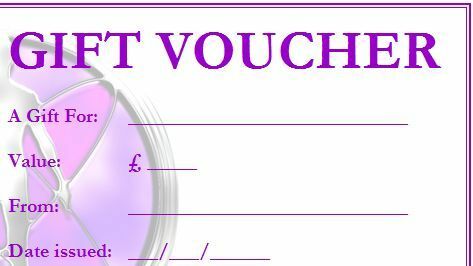 Have a look at my list of massage and holistic treatments and request the gift voucher to any amount. Then contact Andy, with the name of the person you want to gift and how you would like to pay (Paypal, Internet Bank Transfer, Cash). I will then sort the rest for you, your present buying stress relieved and the special person in your life can look forward to a blissful, relaxing, pampering gift! NEVER CARRY CASH? Pay more easily by Internet Bank Transfer! Some of my clients never carry that much cash and are sometimes in a rush from work, etc, to get to their appointment on time and can find themselves stressed with no way of paying. An easy solution to this situation is to pay for your treatment via Internet Bank Transfer. All you need initially are my Bank Sort Code and Account Number. Once you have used these to set me up as a Payee on your Internet Banking system, you can simply select my name from your list online to make the payment simply and easily before attending for your appointment. Please make sure you text me to inform that you are paying via this method before any treatment, so I can ensure that the payment has been made. You can now find me on Facebook and Google+ with exclusive treatment offers, therapeutic tips, aromatherapy cocktails and much more! We all need some time nowadays to escape from the growing challenges and stresses that come into our lives. Time for ourselves, letting our mind slow down, and a calm place to allow us to enter a state of tranquility. 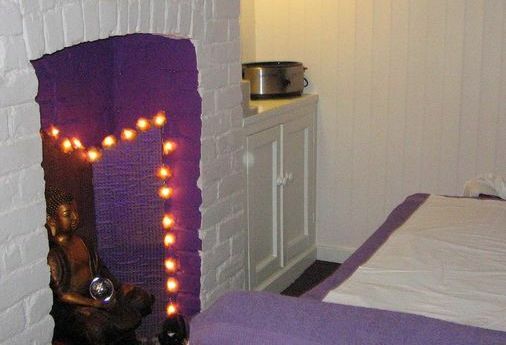 I am fully VTCT qualified and provide a range of massages, from gentle aromatherapy to deep tissue massage, or a fusion of different styles to suit you. For reviews of my treatments by my clients, please see my Google page. NEW CALMING THERAPY ROOM NOW OPEN... we are still at the same address but now you have your consultation and treatments in my much more luxurious therapy room. Click the picture below or this link for more pictures of my new treatment room. Massage is becoming an increasingly popular form of holistic and pro-active therapy, enjoyed by millions of people every day. It effectively reduces stress levels, stimulates the body's self-healing processes and helps replenish our vital energy, restoring equilibrium and balance. Enjoying a massage regularly (such as weekly or monthly) may help repair the body, relax and refresh the mind and enhance spirits, so that we are more able to face the challenges of life with a renewed sense of confidence and ease. If the pressures of life are not released through natural therapies, such as massage, then they can gradually have a more detrimental affect on the person as a whole. Depending upon the choice and combination of massage techniques, the body can either be relaxed or stimulated, making it a useful and enjoyable form of therapy. Massage may alleviate stresses and strains on both the body and mind at once and the effects can often be felt quite instantly after a massage session. Anxiety and Depression: helps relieve the various symptoms of anxiety, depression and alleviate the psychological strain caused. Insomnia and bad sleeping patterns: calms the racing mind down and makes the body feel naturally tired and ready for sleep. Lack of concentration and short term memory: helps to calm the mind and senses, enabling the mind to operate in a more focused way. Cutting down on Alcohol: as a compliment to cutting down alcohol consumption and counseling/support, massage may clear toxins from the body, aid restful sleep and alleviate depression. Blood Pressure: can help to lower high blood pressure. Painful areas that cannot be moved: may relieve strain on muscles and joints in the body and speed up their repair. Causes can be bad posture, awkward movement or minor accidents. Massage may also help prevent Repetitive Stress Injury.